I don't know about you, but I think "Quatre Quarts" has a much nicer ring to it than "Pound Cake". After all, "pound" makes me think of jailed puppies, being punched, and chugging beverages in a most unappealing way, where "Quatre quarts" sounds...well, French. Ramon loves French pound cakeIt's actually the place from which we take our "pound cake" too--the Quatre-Quarts refers to the amount of ingredients involved in making a Frenchie pound cake. But let's not linger on that right now: let's talk about the lovely heart-shaped raspberry flavored one I tried in Paris, at the super-cute patisserie Pain de Sucre. Why is it a winner? Well, for one thing, it's heart shaped and a rather appealing shade of rich, visceral red. And when you bite into it, you'll find it hard to imagine a more luxuriant, buttery, berry-infused cake. It's so dense, it will leave a slick of sweetness in your mouth. That's how you know it's good: the taste lingers so you have many moments to savor and ponder how delicious it is. We just happened upon this place by walking by, but I would firmly suggest seeking it out if you find yourself in the City of Lights. Or, even better, I suggest that you book a flight and get over there right now. 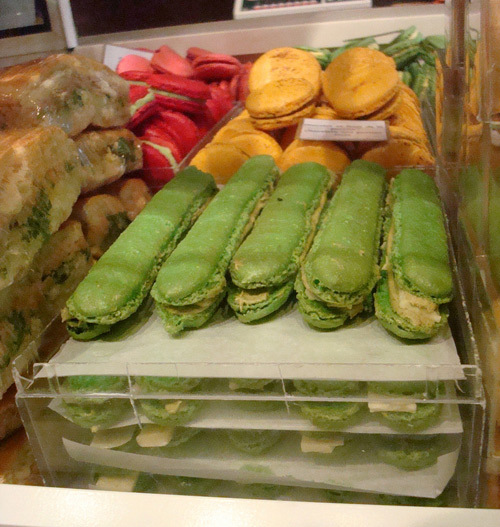 Pain de Sucre, 14, rue Rambuteau, Paris 03; online at patisseriepaindesucre.com.